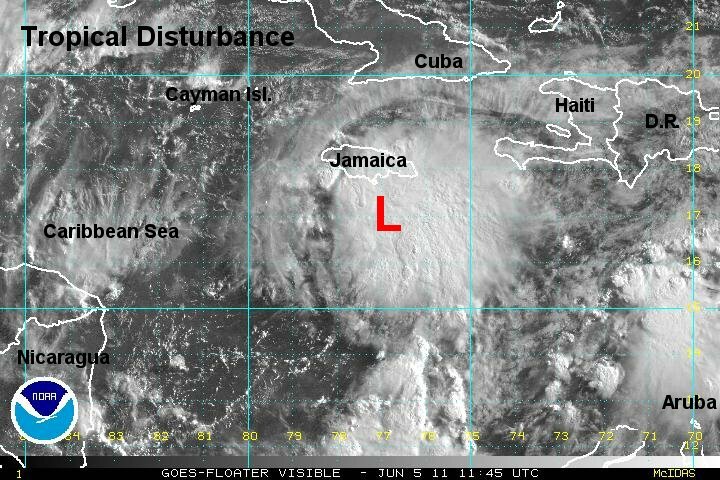 A weak low pressure area has been in the vicinity of Jamaica for the past three days. It appears to be becoming better organized and a tropical depression could form over the next few days. At this time forecast models take the low rapidly northeast past Puerto Rico into the central north Atlantic. Heavy rain is associated with the low near Jamaica. 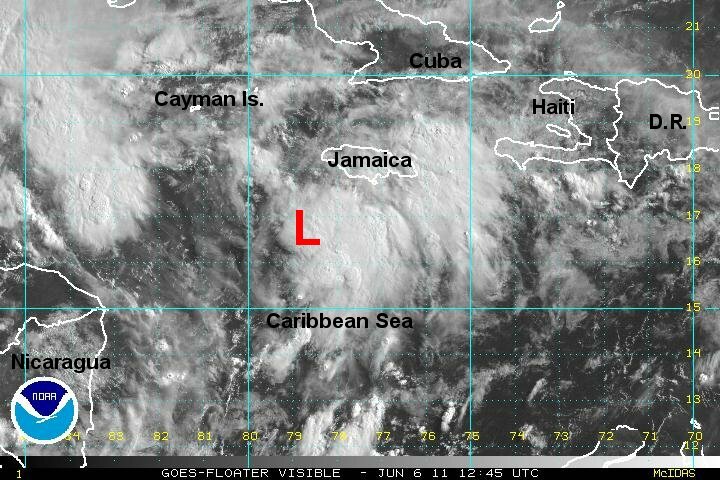 Interests in the northern Caribbean should follow this disturbed area of low pressure. Satellite imagery shows two areas of rotation not far apart. The main area is about 50 miles south of the Jamaican southeastern coast. Deep convection remains with the spin and it is probably close to tropical depression strength. Another spin is noted about 100 miles south of the southwestern Jamaican coast. This one also has convection but appears to be a little weaker. What has been observed today may have solved a concumdrum. The tropical forecast models have been showing a low developing and moving northeast across Puerto Rico into the central Atlantic. At the same time the models have been showing a low remaining south of Jamaica. There may actually be two low pressure systems close together - something that we don't see very often. 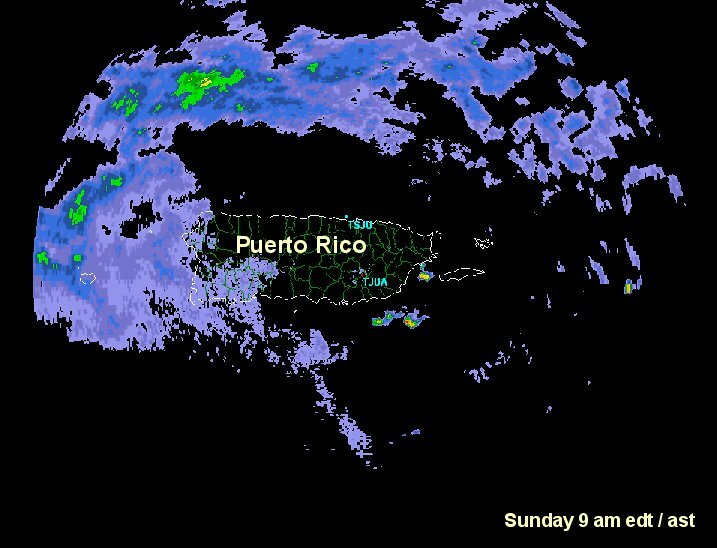 Heavy showers and storms remain with this area of low pressure east to south of Hispaniola and Puerto Rico. It is lifting north across the northern Caribbean and will intersect the cold front. This means that there is the potential for heavy rain with flash flooding. A large mass of showers and storms continue south of Jamaica this morning. It is difficult to tell if there are two seperate low centers or if the broad area of low pressure has consolidated. Some heavy showers are still near Jamaica, but the largest area of heavy rain has shifted south and is offshore. Forecast models continue with a scenario of a low pressure center developing and moving north of Puerto Rico and another drifting into the northwestern Caribbean. 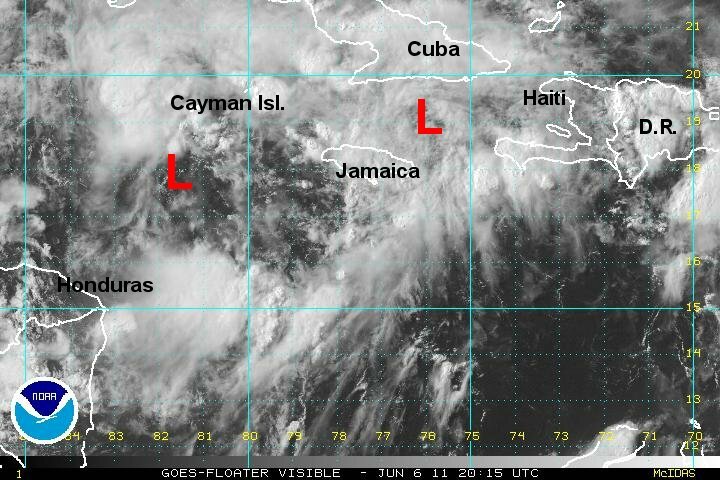 A large mass of thundershowers have also appeared in the northwestern Caribbean. 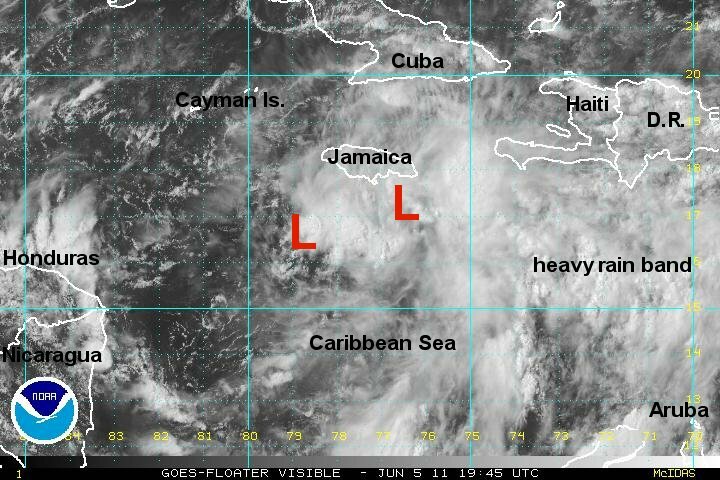 It is possible that the low pressure area is still broad and that the main low will try to consolidate the mass of storms in the northwestern Caribbean and south of Jamaica. We'll know more later today once the recon gives us better data. Today's recon was cancelled. A new one is scheduled for tomorrow. The models have been right suggesting two lows. Today's visible satellite imagery shows one low south of the southeastern tip of Cuba moving north. Another broad low is about half way between the Cayman Islands and Honduras. There is potenital for some develpment with this low before upper winds become more unfavorable by the next couple of days. Heavy showers and storms are scattered from Hispaniola to Jamaica and especially over the eastern half of Cuba. Flash flooding remains a threat on these islands. 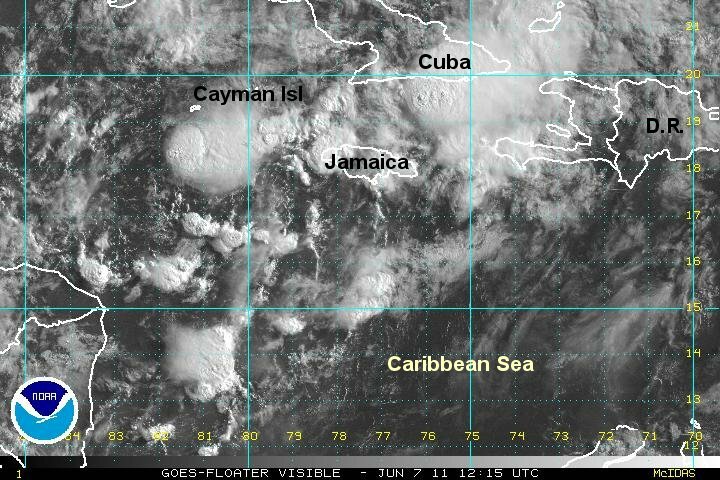 The first visible satellite images show that the low pressure area over the western caribbean has become disorganized. It probably has missed its window of opportunity to develop. No low pressure area was placed on the satellite imagery below since it has become diffuse. 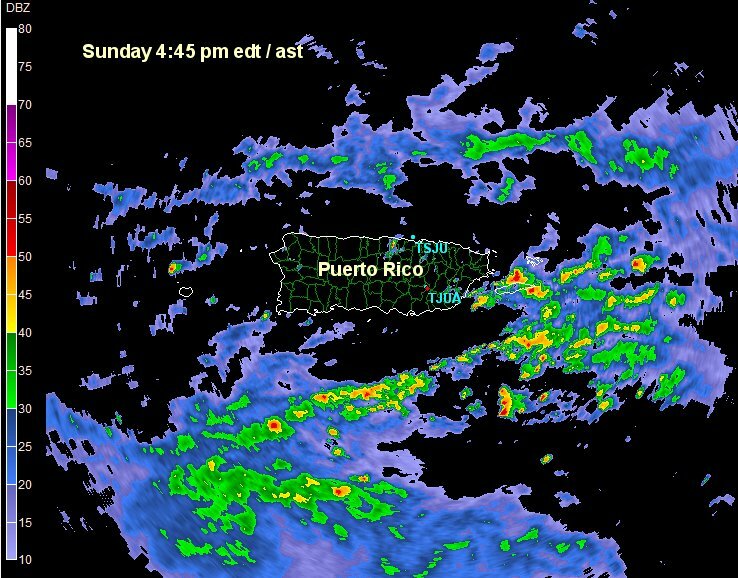 Heavy showers and storms still continue in several clusters over the Caribbean and could produce flash flooding. This will be the last update on this low unless it becomes better organized.